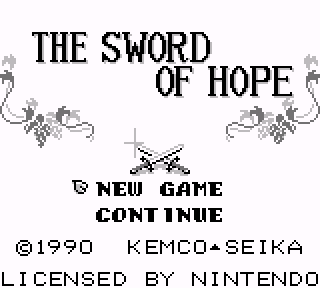 Sword of hope is an older style frame to frame RPG. By frame to frame of course I refer to the fact that movement is made frame by frame. I have to say though once you get playing this game it becomes very intruiging. I used to play this game all the time, I even went to the lengths to buy a gameboy to play this game. Its fun and gets complex, and it was an engaging story wrought with puzzles. Now you can add videos, screenshots, or other images (cover scans, disc scans, etc.) for Sword of Hope, The (USA) to Emuparadise. Do it now! If you haven't noticed yet, we have a retro game of the day feature (top-right of the screen) wherein we feature a new retro title every single day! Now, you can vote for your favorite games and allow them to have their moment of glory. Click on the button below to nominate Sword of Hope, The (USA) for Retro Game of the Day.